Fall decorating supplies are expensive so I make my own decorations to keep the cost low. Head to the farmer's market to find everything you will need for a fall party or Thanksgiving holiday decorations. Pumpkins and gourds of all shapes, sizes and colors are everywhere and it seems each year there are wildly varied new species just waiting to be made into a beautiful or scary decoration. The colors are so vibrant--- and the yellows, oranges, rich reds, dark coppers and browns just say fall, don't you think? I brought home our haul and started hollowing out gourds. 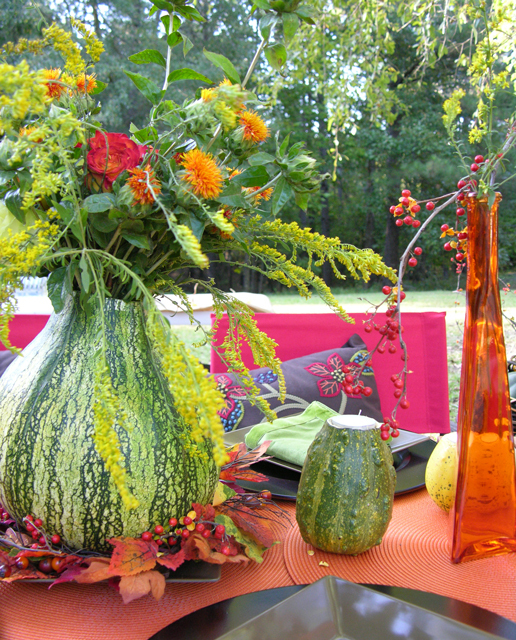 The large gourds are perfect for vases and the small gourds are ideal containers for votives and tea lights. You can use them two ways as shown below. 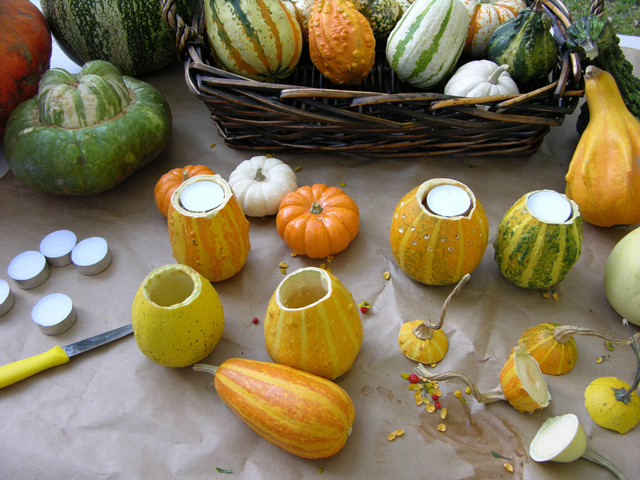 To make the candle holder: Use a paring knife to cut the top off of the gourd then scoop out the inside. You can put the tea light into the bottom of the gourd, which accomplishes two things. It keeps the wind from blowing out the flame and it results in a softer glow. You can also fit the tea light into the top of the gourd. Use a crossed toothpick inside the gourd to keep the candle from falling inside like I did in the picture below. For flower arrangements: I was lucky enough to find a farmer selling bittersweet. I love bittersweet-- these yellow and orange berrylike branches. They are perfect for centerpieces and look great in the yard as an accent to mums and other fall flowers. These are a mix of flowers from the yard and a few I picked up at the florist. Some gourds may leak so I filled a plastic zip-top bag with cool water, cut the flower stems on an angle and put them inside. Wrap below the sight line with a rubber band to keep it secure and put the arrangement inside the gourd. You may try using Vaseline petroleum jelly on the outside of the pumpkin or gourd to slow deterioration. Just rub a bit on a cloth and polish the outside of the gourd. You can also do this on the inside of your pumpkin after you hollow it out to retard deterioration. Have you ever been to Italy? Specifically, have you ever been to Capri or the Amalfi coast? 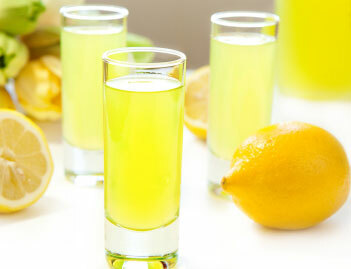 If you have, you probably remember the lemons and you've probably experienced limoncello, a luscious lemon liqueur. The Italians typically serve it after dinner as a digestive or with flaky Italian pastries or rich desserts. I am a big fan of limoncello. Not only does it remind me of a wonderful summer in Italy a lot of years ago, it is a fast and easy ingredient for cocktails and even for a super quick dessert. Pour chilled limoncello over pound cake and berries, over vanilla ice cream, or add it to your store bought lemonade or iced tea. Makes a great addition to an Arnold Palmer! I keep a bottle in the freezer for late afternoon summer sipping.... takes me right back to Italy. 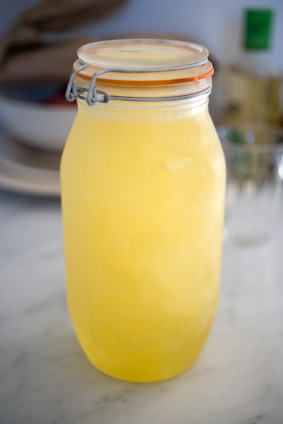 When I first learned to make limoncello, you could not find it in the stores. 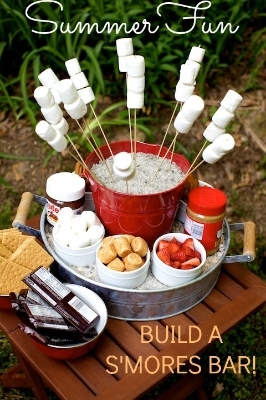 Nowadays, you can find it readily but it is so much more fun to make your own. 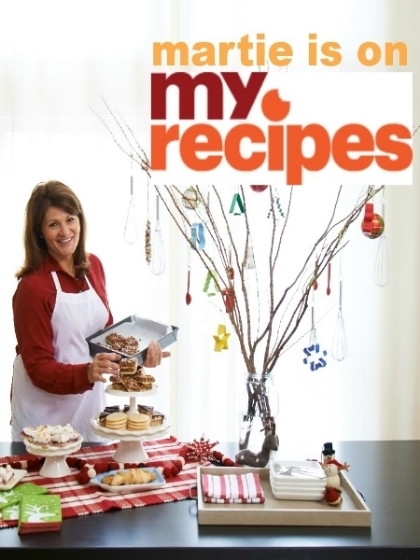 Make a double batch and give it as a gift! It's a wonderful summer tradition. I got this recipe from an Italian friend a few years ago and tweaked it until I got it just right. You do not have to use the vanilla bean; that's my own spin. A couple of important notes: you have to take care to get rid of the white pith of the lemon rind. It becomes bitter in the distilling process. Also, you can use grain alcohol instead of vodka. I've made it both ways and simply prefer the vodka version but there is not a disenable difference in taste or cost. Select thick skinned lemons that are fully yellow with no green or soft spots on the exterior. Typically, I prefer lemons with a thinner skin when juicing, but the thicker, dense peel is better for zesting. Wash the lemons well. Use a brush to remove any wax or residue on the peel. Pat dry. Peel the lemons using a vegetable peeler. Use only the outer part of the lemon rind. Try not to remove the white pith, If you do, take a sharp pairing knife and remove as much of it as possible; discard. Reserve the lemons for another use like lemon marmalade or fresh lemonade that you can freeze for a few weeks, if necessary. Put the lemon peel into a large glass container, like a Mason jar, a large pickle jar, or a pitcher with a tight-fitting lid. Add the vodka or grain alcohol. If you are adding the vanilla bean, add it now. Split the bean and using the back of your knife, remove the seeds by scraping the bean. Add to the jar and secure the lid tightly. Allow to sit undisturbed at room temperature in a dark place for ten days. Do not disturb the mixture or stir. Just wait patiently as the vodka soaks up the yummy lemon flavor. On the 11th day, make a simple syrup by combining the water and sugar in a pan over medium heat. Stir occasionally until sugar completely dissolves. Allow to cool completely. Pour the simple syrup over the lemon peel/vodka mixture. Cover and allow to stand at room temperature for at least 24 hours but the preference would be to let it stand for at least another 10 but no longer than 20 days; the longer you allow it to stand, the better the flavor will be. Strain the liquid to remove the peel and the vanilla bean, if you used it. Pour the liqueur into pretty bottles with a stopper or tight-fitting lid. Seal tightly and refrigerate. If you don't have a fine mesh strainer, line colander with a coffee filter as a quick substitute. Chill well before serving. The limoncello should be very cold. You may even store them in the freezer to extend the prime flavor. Serve very cold; in tall shot glasses or cordial glasses. And as they say in Italy... "No poem was ever written by a drinker of water." - From the great Roman poet Horace around 65 BC. MAKE ICED TEA AT HOME, Y'ALL! It is hard to imagine... most people buy tea already made from the store these days rather than make it at home. I confess, I do buy tea already made when I'm on the road or when I'm in a hurry or I simply need a ton of it. But iced tea is so good when it is freshly made and poured over the ice when it is still barely warm. It is one of the cheapest and most versatile beverages you can make for a party and also one of the most refreshing! For those of you who have never tried to make iced tea yourself, here's the how-to. You may never buy a gallon of tea at the store again. For a quart of tea you need a 1-quart tea bag and 4 cups cold water. Put the water in a pot or large saucepan. Bring to a boil. Remove from heat. Drop in the tea bag. Let steep for 7 minutes. Discard the tea bag and let the tea cool completely. To serve: Pour over ice. Add sugar, simple syrup, lemon, or mint, to taste. Ahhhh. I prefer using simple syrup to sweeten my iced tea and that way guests can adjust the sweetness to their own taste. Making simple syrup could not be easier. It is equal parts sugar to water. Put the sugar into a pot with cold water. Stir to help dissolve. Over medium-high heat, bring just to a boil and immediately remove from the heat. Allow to cool completely. Pour into Mason jar. It will keep in the fridge for at least 2-3 weeks.